ItemB-01117 - "General view"; construction of the Fraser River Bridge in New Westminster. ItemB-01118 - "Crib pier No. 6"; construction of the Fraser River Bridge in New Westminster. ItemB-01119 - "Cittomg edge pier No. 4"; construction of the Fraser River Bridge in New Westminster. 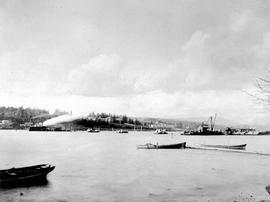 ItemB-01124 - "General view, looking south"; construction of the Fraser River Bridge in New Westminster. ItemB-01112 - "Crib pier No. 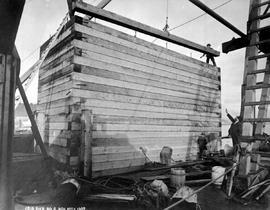 9"; construction of the Fraser River Bridge in New Westminster. Armstrong, Morris and Company was a building construction firm whose work included the substructure of the Fraser River Bridge at New Westminster. The fonds consists of Armstrong, Morris and Company's photographs showing the substructure of the Fraser River Bridge at New Westminster.